So I met up with my mom for lunch saturday at Seasons 52. If you don’t know about it, it’s a place that prides itself on serving seasonal cuisine, and everything is under 475 calories. They have locations in florida, georgia, illinois, pennsylvania, & new jersey. The best part is they have a separate VEGAN MENU, so make sure you ask for it! It’s not incredibly extensive, but it’s nice that you can go to a regular place, and they have all the options laid out for you. 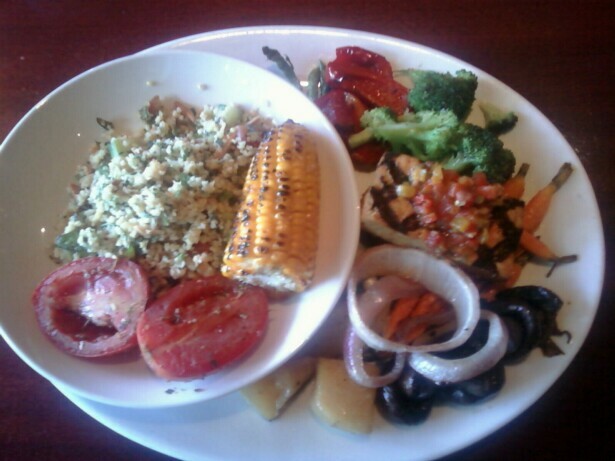 I knew they had a vegetable plate there, but wasn’t prepared for how lovely it was! SO delicious. What a great meal! Everything was so good, including the service. I was so pleased : ) PS- When I was talking to the server, she mentioned that they actually don’t use any butter at the restaurant.